A history of excellence and caring. 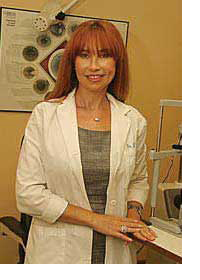 After receiving degrees from UCLA and the Southern California College of Optometry, Dr. Svetlana Fisher began practicing Optometry in the Los Angeles area in 1992. Since this time, Dr. Fisher has owned and operated five successful private practices, including locations in Studio City, Pasadena, Reseda, San Fernando, and West Hollywood. With a strong emphasis on pathology and contact lens wear, Dr. Fisher is a very well regarded expert in the field. Both her peers and patients praise her consultations in these areas of optometric care. In addition to the medical knowledge, Dr. Fisher bring to her practice a solid reputation as a warm and caring practitioner. She strongly believes in taking the time to speak with and understand the specific needs of her patients. When asked about her professional philosophy, Dr. Fisher says, "It has always been my goal to offer patients the respect they deserve when they come into my office." Ensuring this attitude on an everyday basis, Dr. Fisher makes sure that her highly qualified staff of managers and opticians offer patients nothing but the best in care and hospitality. When not working, Dr. Fisher enjoys spending time with her two children ages 12 and 26, gardening, exercising, and reading.